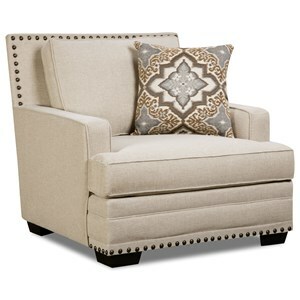 Tuck this square chair into the corner of your room to create a cozy sense of enclosure and a chic, upscale appearance. Tall, track arms and sturdy wood block feet complete the structured look. 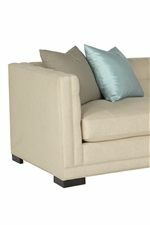 Incredibly comfortable as well as stylish, this chair is furnished with a channeled, foam and fiber cushion for a soft, resilient seat with lasting structure. 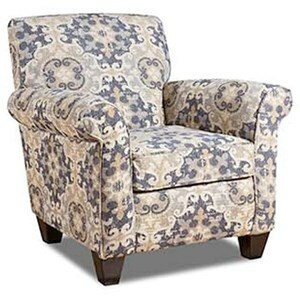 Customize the chair and complementing toss pillow in the fabric color and pattern that best matches your style. 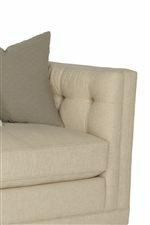 The Abby Contemporary Button-Tufted Corner Chair by Jonathan Louis at Thornton Furniture in the Bowling Green, Alvaton, Glasgow, Scottsville, Franklin area. Product availability may vary. Contact us for the most current availability on this product. Padding & Ergonomics Channeled Blown Fiber Seating: Features High-Resiliency Foam core encased in a bag filled with blown polyester fiber and channeled to keep the fiber from shifting. Made to emulate a relaxed feather and down seat. The Abby collection was designed for the homeowner who's on the cutting-edge of fashion. This chic and feminine look is straight out of the pages of your favorite, glossy decor magazine. Catch eyes with the tailored tuxedo sofa and corner chair, both lined with thick cushioning and cozy, button-tuft detailing. Finish the look with the textural contrast and slender shape of an exposed wood accent chair, covered in customizable bonded leather. To make the striking design of the Abby collection part of your home, select from our wide selection of upholstery fabrics to easily add your personal stamp. The Abby collection is a great option if you are looking for furniture in the Bowling Green, Alvaton, Glasgow, Scottsville, Franklin area. Browse other items in the Abby collection from Thornton Furniture in the Bowling Green, Alvaton, Glasgow, Scottsville, Franklin area.